You don't? Oh. Maybe that's because I still never posted them. Well... here is a peek at Christmas Eve. Here is what we looked like when I tried to figure out how the timer on my camera works and we used a cardboard box to get the camera in place. That's when Nick realized that maybe I could use a tripod. Too bad Santa didn't realize ahead of time. haha. Here is what we look like when Zoe takes our picture. This makes me laugh every single time I look at it. I have no idea why. 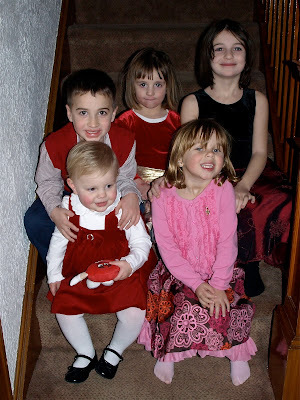 Here is the very best photo I was able to get of all of the cousins together. Ana's face here TOTALLY cracks me up. It's like you can see her thinking "I can't believe I'm related to these people." And here? Here I swear I can hear her thinking "It's sweet and all that you love me and give me these great smooches... but you are SO not getting a bite of my cookie. No way sister." I have to put a decent shot of Ana's dress. 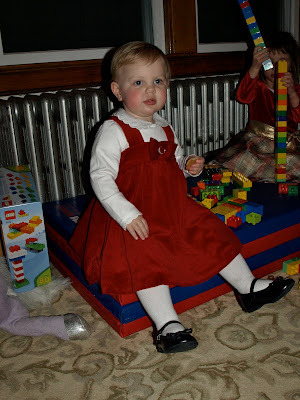 She just looked so cute in her little velvety dress (cookie in hand). Ana couldn't control herself when she saw the crayons. 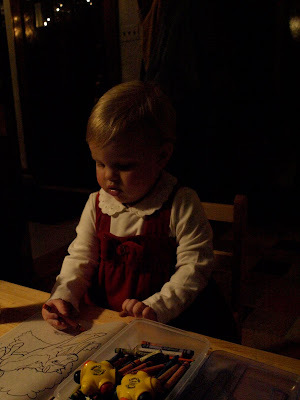 There is no stopping her from coloring. And of course... there was a little bit of present opening. Shortly after we headed home and got off to bed as quickly as we could. We definitely didn't want Santa to skip over our house just because we were out a little late. Thankfully we must have made it on time... because shortly after we were all asleep I woke up and made a quick trip to the bathroom. I was amazed to see the lights coming up the stairs and had to take a peek. That Santa... he sure is just full of magic! I had a very hard time getting back to sleep knowing what a fun time we were going to have Christmas morning! So... it only took me a month and a 1/2 to get Christmas Eve posted. Anyone wanna take bets on when you'll get to see Christmas day?